The Ladonian Cabinet has unanimously voted to ratify the Alcatraz Environmental Treaty that was signed by the Queen on behalf of the government in the Free Republic of Alcatraz last July during the Polination III Conference on Micronations. The Queen and The Crown Princess attended the event as part of the Ladonian delegation, and The Crown Princess was a vocal participant in the committee that proposed the terms of the accord. 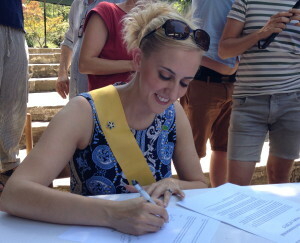 Queen Carolyn adds the first signature to the Alcatraz Environment Treaty of 2015 at the Polination III Conference on Micronations in the Free Republic of Alcatraz. Ladonia was the first of eight micronations to sign the agreement. The other original adopters/signers include the Free Republic of Alcatraz, the Republic of BennyLund, the Principality of Aigues-Mortes, the Grand Duchy of Flandrensis, Noseland, the Empire of Angyalistan, the Fomoire Institute, and Bundes Republik Neustadt. Since the conclusion of the Polination III conference, at least 8 additional micronations have adopted the treaty. Whereas we, the assembled Micronations of the 3rd International Conference on Micronations, have reached the conclusion that the large states of the world have been ineffective and their efforts have been lacking in intention and execution concerning efforts to improve the environment, preserve existing natural resources, and reduce carbon emissions to slow the change of the climate. Therefore, we, the nations that are considered silly by the large nations, are entering into an agreement amongst ourselves to make a serious effort to preserve and protect our environments, and to ensure that we do everything within our power to reduce our communities’ carbon emissions and slow/reverse the climatic change to ensure that our nations are not lost to the rising ocean levels. We shall set an example for all nations and make a priority the preservation and protection of plants (flora) and animals (fauna) native to our respective communities through a combination of responsible/conservative use of natural resources, responsible agriculture, and water conservation. Special care will be taken to ensure the survival of local bee populations. We believe and agree that Antarctica is one of the few places on this planet to remain relatively untouched by humans and we strongly believe that it should remain a nature preserve only available to scientists for scientific research well beyond the expiration of the Antarctic Treaty in 2020. We shall set an example for all nations by creating highly localized sub-currencies that will promote the local production and consumption of goods and produce. Local production and consumption minimizes transport needs/costs and minimizes carbon emissions as a result of the reduced need for transport. We shall commit to researching and funding efforts to clean the human generated debris from the oceans and reduce the “garbage patches”. We shall commit to structuring our financial systems in ways that strive to reduce poverty and elevate the standard of living for all of our peoples in an environmentally non-exploitative manner. In addition, we demand, for every square foot of land or glacier lost to melting ice sheets and rising ocean levels, compensation from the large landed nations of one square meter of dry/non-threatened land so that we may relocate the climate refugees that will be created as a result of the rising waters.